Gerhard Michalski was born on 25 June 1917 at Augsdorf in the Mansfeld region of Harz. Michalski was posted to JG 53 in 1940. Leutnant Michalski was assigned to the Gruppenstab of 6./JG 53. He gained his first victory on 31 March 1940, when he shot down a French Morane fighter over the French border. Michalski later participated in the Battle of Britain gaining eight victories. On 1 October 1940, he was appointed Adjutant of II./JG 53. Operating over Russia, Michalski was to claim 13 further victories by the end of August 1941 to raise his victory total to 22. On 1 October 1941, Oberleutnant Michalski was appointed Staffelkapitän of 4./JG 53 based at Leeuwarden in Holland. In late November, II./JG 53 relocated to Sicily. Operating over Malta, Michalski was to become the most successful German fighter pilot in this area recording 26 victories. Michalski was appointed Gruppenkommandeur of II./JG 53 on 1 June 1942. He also recorded his 30th victory the same day. Oberleutnant Michalski was awarded the Ritterkreuz for 41 victories on 4 September. On 15 October, Michalski was shot down in aerial combat with RAF Spitfire fighters off Marsaxxlokk Bay on his 500th combat mission. He baled out of his stricken BF 109 G-2 (W.Nr.10 484), landing in the sea. He was rescued by a Do 24 three-engine flying boat of the German air-sea rescue service. In October 1942, II./JG 53 were relocated to Tunisia. By the beginning of May 1943, Michalski had recorded eight further victories, including his 50th victory, a Spitfire shot down over the harbour of Bone, on 1 January 1943. Following the fall of Tunisia, II./JG 53 relocated to bases in Sicily in May 1943. On 18 June, Michalski was shot down near Donnafucata in Sicily in Bf 109 G-6 (W.Nr. 16 362) in aerial combat with Spitfires. He baled out wounded, landing in the sea, from where he was rescued by the German air-sea rescue service and taken to a hospital in Ragusa. From Left: Fw. Otto Russ (27 victories, DK-G, KIA 2.7.1944), Hptm. Gerhard Michalski, Oblt. 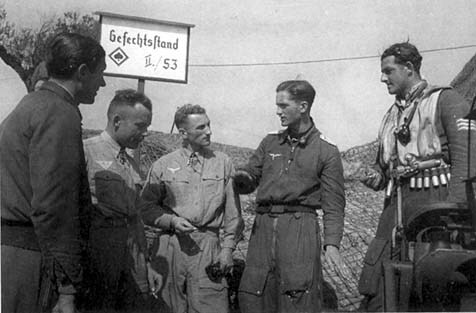 Fritz Dinger (67 v., RK, KIA 27.7.1943), Lt. Wolfgang Dreifke (3 v.) and Fw. 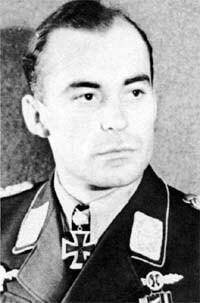 Hans Feyerlein (at least 13 v., EP, KIA 16.3.1944). La Marsa, II./JG 53`s command post, March 1943. Michalski returned to JG 53 in late August 1943. On 1 September, Major Michalski temporarily assumed command of JG 53 when Kommodore, Oberst Günther von Maltzahn (68 victories, RK-EL) was forced into hospital with a severe bout of malaria. Von Maltzahn returned to the Geschwader on 28 September and Michalski returned to command II./JG 53. In November 1943, II./JG 53 was relocated yet again. Based in Austria the Gruppe operated on Reichsverteidigung duties. Michalski recorded his 60th victory on 2 November. On 24 April 1944, Michalski was appointed Kommodore of JG z.b.V based at Kassel in Germany. The unit was formed to control III./JG 3, I./JG 5, II./JG 27, III./JG 54 and II./JG 53. On 1 May, he was shot down and wounded in Bf 109 G-6 (W.Nr. 440 232) in aerial combat. Following his recovery, Michalski was transferred to the Verbandsführerschule of the General de Jagdflieger on 20 May 1944. On 21 July, he was transferred to the Stabsstaffel of I./JG 11. Michalski was appointed Kommodore of JG 4 on 18 August 1944. Major Michalski was awarded the Eichenlaub (Nr. 667) on 25 November for 72 victories. He gained his 73rd, and last, victory on 8 March 1945 over the Eastern front. Michalski was involved in a motor vehicle accident on 22 February 1946. He died in hospital at Kaltenkirchen. 11:50 B-17 HSS II./JG 53 5km SE Beja / not confirmed? 14:10 P-38 II./JG 53 9848/03 Ost / not confirmed?